Some Day I Will Thank Me for This. Those are words I heard from my parents when I was growing up, usually when I was being punished or corrected for one of my many transgressions. I heard them so many times, the words are firmly fixed in my head, never to be forgotten. It’s not that I was bad, it was just that I was strong-willed and always thought my choices were CLEARLY right. Usually, my ill-advised choices are related to nutrition, exercise, and maintaining my commitment to living a healthy lifestyle. Thus, my current weight of 204 lbs. *** Dinner tonight: Filet Mignon, butternut squash, and string beans. Heck, I’ll thank me for this today! Then, there are the days that I’m following my plan to take better care of myself and my thoughts turn to my mother. She had many medical problems that included 6 back surgeries, 2 rotator cuff surgeries, breast cancer and a mastectomy to go with it, diabetes, and polymyalgia rheumatica, that, in the end, cost her the use of her legs. 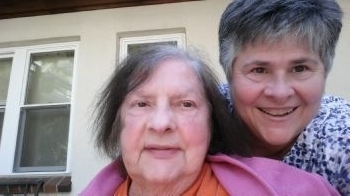 The last 7 months of her life were a physical deterioration that saw her spending most of that time in hospitals, rehab, and, finally a nursing home. The last 2 – 3 months of her life, she told me every day that she wanted to die and she flat out refused to eat. Over the course of her illness, I told myself many times that I had to have a better “exit strategy” than the one she did. I guess that whole situation is what motivated me to turn myself around. It took me a few months to get my head in the right place. There was her funeral, cleaning out my childhood home, and the holidays before things settled down enough for me to get moving. Since then, I’ve been on track and making slow, but steady progress. In fact, I’ve been doing so well, that when I met with my sleep apnea doctor last week, he about did back flips. He told me he was very impressed with the way I’m taking care of myself and that, after our last appointment 6 months ago, he was pretty ambivalent about my chances of losing weight. He actually said, “I guess you showed me!” Ha! So, while my progress hasn’t been as fast as I’d like and I’ve had a few slips that I try not to beat myself up over, I know that my future is bright. I'm right there with you. Heart related dementia and diabetes run like the Mississippi River in my family, and I am determined to break the pattern. I am determined to thank myself for the efforts I'm putting forth this year and next year to become a healthier, happier me! So beautifully heartfelt and written. I have no doubt you will thank yourself today and "Someday" when you're able to do something you really love but haven't for a while - like take a sweet horse for a long and meandering trail ride, or climb and hike to capture the perfect picture of a flower, bird or critter. When you try on new clothes in the dressing room for a special occasion and you feel pride in your appearance. These wonderful things and many more await you. You're so close to onederland!